EDWARDS AFB, Calif. --- Leveraging new technologies is what innovation is all about. Tech. Sgt. 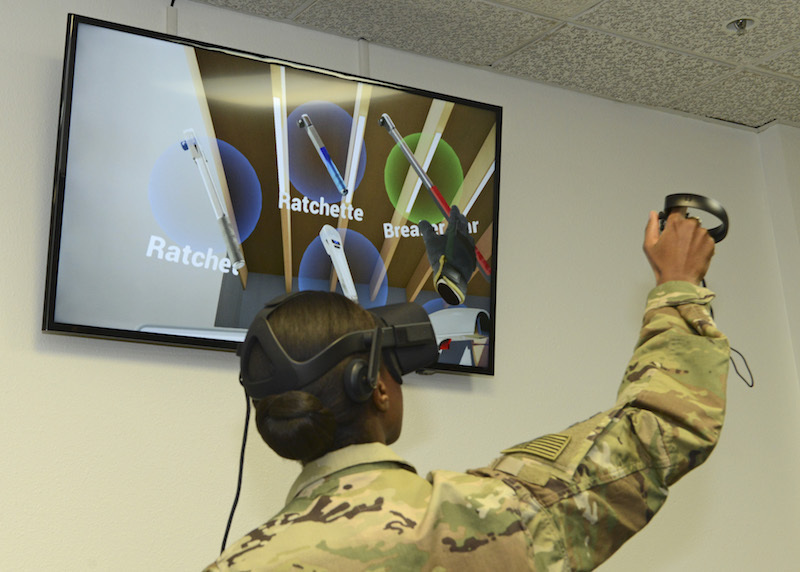 Jeremy Neilson had a creative idea to establish an interactive virtual/augmented reality capability at the F-35 Integrated Test Force to conduct maintenance-related training. Virtual reality training would enable operators to accomplish qualification or proficiency training without diverting real-world assets from the mission, which preserves limited, high value equipment. Neilson pitched his idea to the 412th Test Wing’s innovation team, XCITE, and it was selected for funding. His leadership as project manager for the effort resulted in his recognition as the 412th Test Wing Innovator of the Quarter for the first quarter of 2018. The beauty of VR is its ability to transform a high risk or potentially fatal situation into an immersive interactive experience in a safe environment. The opportunity to rehearse actions in a VR environment that simulates exposure to high risk situations can enhance an individual’s readiness to perform intuitive responses without risk of harm to personnel. Virtual reality training can be very cost effective. It could enable dislocated qualification sessions using schoolhouse instructors without sending members traveling. Reducing temporary duty time also enhances the work/life balance for Airmen. In addition, VR removes real-world assets from being utilized during training, freeing up resources while preventing costly damage to high-value items. VR could also simplify many training burdens. Initial and remedial training sessions can be accomplished and recorded within the device. Proficiency training can be elevated in realism and scope allowing for training on tasks that are conducted infrequently due to lack of available training aids. Readiness-related operations could be rehearsed and refined without subjecting members to austere conditions due to geographic constraints. Finally, VR environments can be varied for complexity, realism and even lethality to simulate operations in virtually any conditions. One of the keys to advancing a culture of innovation across the wing is promoting a mindset that encourages the workforce to embrace new technologies that satisfy the Air Force’s emerging needs.